In the last couple of weeks I got error messages every time I tried to login to Yahoo! Mail. However, if I clicked "Try again" in the next page, I could access my mail without problem. For a while I just ignored these errors, but today they bothered me enough to make me try fixing the problem. While these solutions have worked in the past for me for similar Yahoo errors, today they had no effect. However, when I read more carefully the last error page, I realized it was talking about a program modifying the html page and about firewall settings blocking ads. It then hit me I was running an Internet Explorer add-on program, IE7 Pro 2.0 that I use for blocking image-ads and Flash-based ads. 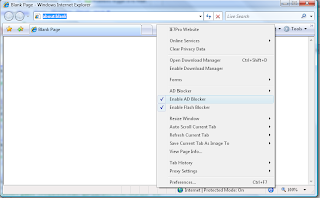 Ad blocking in IE7 Pro can be easily disabled from the context menu (not from firewall settings). As soon as I disabled ad blocking, Yahoo! Mail page opened without problem. For a permanent solution, I enabled back ad blocking in IE7 Pro, accessed the Yahoo Mail account (got again the errors), and when I got the "Click here to try again" page, I used IE7Pro context menu to select "Ad Blocker / Don't filter this site". 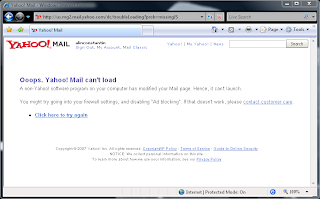 I have this program as well, but Yahoo is not allowing me to even get into my mail. Are there any other fixes? The yahoo people are non responsive and I need to get into my mail. Alin, thank you!!! I was having the same problems with yahoo mail for months and this finally fixed it. Sorry, I have no idea what other solutions may exist. 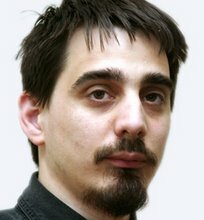 I'd search the net, perhaps someone else has found other programs causing similar effects (e.g. I suspect other ad blockers or html filter programs may have the same result as IE7Pro), and may have different solutions for them. Alin, you ROCK! Thank you, thank you, thank you! This has been driving me crazy for months. You are the best! Alin, thank you, I am having the same problems with yahoo mail and I follow you to fix it but I don’t know how open the context menu. Please help. 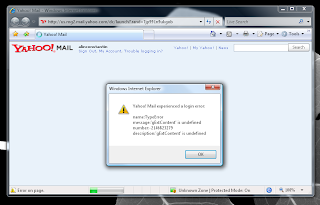 The context menu for IE7Pro can be opened by right-clicking with the mouse the blue 'e' icon in the Internet Explorer's status bar. In this picture the icon is visible at the bottom right of the context menu. Hey thanks Alin, even I had a problem logging into yahoo. I changed the ad-blocking settings and now everything's working fine.